Kids will have a blast in the sturdy Smoby My House. This modern playhouse features a bright red roof with realistic tiling details and two red dormers. The opening shutters and the half doors at the back and front of the house provide kids with even more ways to play! Ring the electric doorbell, unlatch the door and step inside the Smoby My House. Discover a world of imaginative play in this colourful house. Kids will love fun details like the birds above the shuttered window and the porthole window by the door. Children can gaze out from the circular window and imagine their playhouse transforming into a ship or rocket! Your kids can play house, deliver post through the mail box, recreate their favourite fairy tales or simply enjoy having a place to call their own, whether in the garden or the playroom. 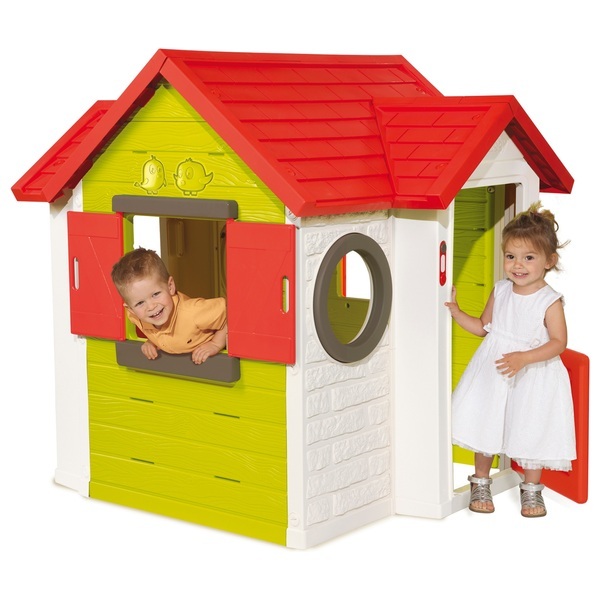 The contemporary design of the Smoby My House creates a playhouse with a realistic feel. The exterior of the playhouse features textured wood and stone effects. The structure of te playhouse is durable and weather-resistant, with blow moulded side walls, injected facades and Anti-UV treated plastic pieces to ensure greater colour durability over time.